As every parent finds out eventually, your child getting sick is just a part of growing up. While it may be human nature to freak out at every new injury or symptom, unnecessary visits to the doctor can really add up. Knowing the most common illnesses and their symptoms can help you decide when your child’s illness warrants a doctor’s visit. 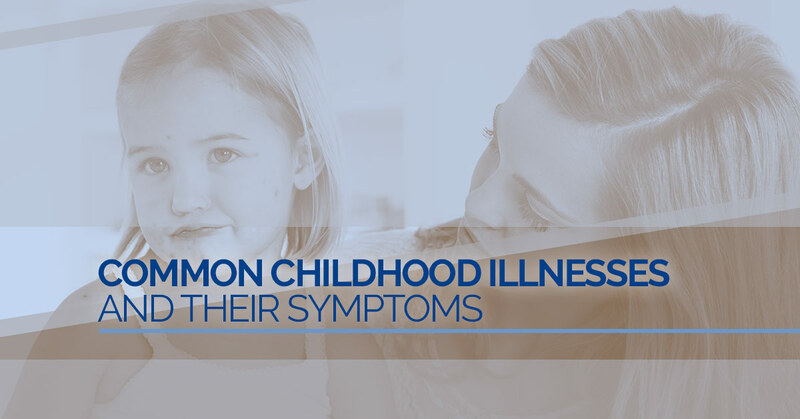 Here, we would like to go over the most common childhood illnesses and the symptoms that may present. Chickenpox (varicella) is probably an illness you’ve heard of; it’s extremely common, and relatively mild. However, when left untreated it can lead to major complications, even death, so it’s important to seek treatment for children. Symptoms present as red, itchy rashes that can turn into pus filled blisters, which break and scab over when cracked. Usually, a fever persists for a few days during the illness as well. When left untreated, serious complications including pneumonia, bacterial infections, or encephalitis can occur. There is no cure or specific chicken pox treatment, however paracetamol can be used to relieve any fever symptoms and calamine lotion is often used to ease excessive itching. Croup is a lesser known, but extremely common, illness is children under five. Caused by the same virus that causes the cold, it creates inflammation in the windpipe, lungs, and vocal cords. Symptoms present as a harsh, barking cough, and a grating sound called a “stridor” when the child takes in a breath of air. Your child may have trouble swallowing as well. Diagnosis is usually straightforward, and treatment can generally be done at home. While the disease is often the cause of a lot of worry for parents, it also is not too serious. It’s generally good practice to start introducing your child to solid foods around six months old. This not only prevents them from building up food allergies, but also alerts you to any food allergies they may have already built up. Symptoms of your child having an allergic reaction include diarrhea, vomiting, wheezing, rashes, swelling of the throat or tongue, red eyes, and a runny nose. It is recommended that you speak to your doctor regarding testing for allergies in your children. If your child has a severe allergic reaction (prophylaxis), seek emergency medical attention immediately. Measles is caused by a virus that is highly infectious. It transmits through tiny water droplets floating around in the air. Anybody that hasn’t been vaccinated can be infected with the measles virus. Common symptoms associated with measles include fever, watery eyes, cough, and possibly a red, slightly raised rash. Measles is a vaccine preventable disease, so it is recommended that you get your child immunized. It is also extremely rare for someone who has contracted the disease to get infected with it again. Another extremely contagious virus, mumps is most commonly found in children 5-15 years old. This virus is also vaccine preventable, and therefore much more rare than in previous history. Mumps symptoms include headaches, fever, joint pain, and the signature painful swellings of the face and ears. A common reference to these symptoms is if the face has a “hamster-like” appearance. If your child presents with these symptoms, it is a good idea to have them checked out by the doctor immediately. If they become severe, it’s best to call for emergency medical help. Pertussis, more commonly known as whooping cough, is a highly infectious bacterial contagion that affects the lungs and its pathways. This illness most seriously affects babies under 12 months of age, before their second round of vaccines immunizes them. Common symptoms of whooping cough include a constant, irritating cough (with its character whooping noise), runny nose, fever, and vomiting. People with whooping cough are contagious from the first signs of symptoms up to six weeks after. If symptoms persist, it is recommended that you seek immediate medical attention for your child. Immunizations for whooping cough are also available for pregnant women. Hopefully you feel a little more comfortable now with recognizing symptoms of illness in your children. Here at Alaska Pediatric Surgery, we want your child to be healthy and happy. For all of your child’s surgical needs, trust the pediatric surgeons at Alaska Pediatric Surgery. Contact us to schedule your consultation today!